Traditionally, this data would be stored on a single desktop or laptop computer. That’s fine but most families want to share this data so all members of the family can access it when they need to. The obvious solution is to copy the data onto each machine but this leads to issues keeping the copies in sync. Another solution is to have one media repository and sharing it over a local network. You could do this by nominating one computer on the network as the primary machine and using it to store and share the data. But now that machine has to be present on the network all the time and powered on. The ultimate solution is to have a dedicated device on your network whose sole purpose is to securely store, and share your data across your network. Such a device is called a Network Attached Storage or NAS. The use of NAS devices – and their big brothers SANs (yep that’s is their real acronym) – have been limited to business data centers due to the cost and complexity of setting them up and keeping them running. 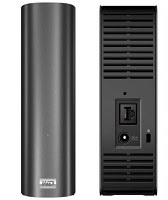 Those few consumer level NAS devices that have appeared in recent years have been expensive and still needed the assistance of a friendly nerd to setup and configure (JBOD or RAID 10 anyone?). In most cases it was simpler and a lot cheaper just to dedicate an old Linux desktop PC to the job or use something like Windows Home Server with some shares configured. The Western Digital My Book Live (WDMBL) is a new breed of consumer NAS. One that is only slightly more expensive than a USB drive of the same capacity and is so simple to use that most people will get it up and running without needing a visit from the friendly nerd. Physically, the device is just a bit bigger than an older USB drive. 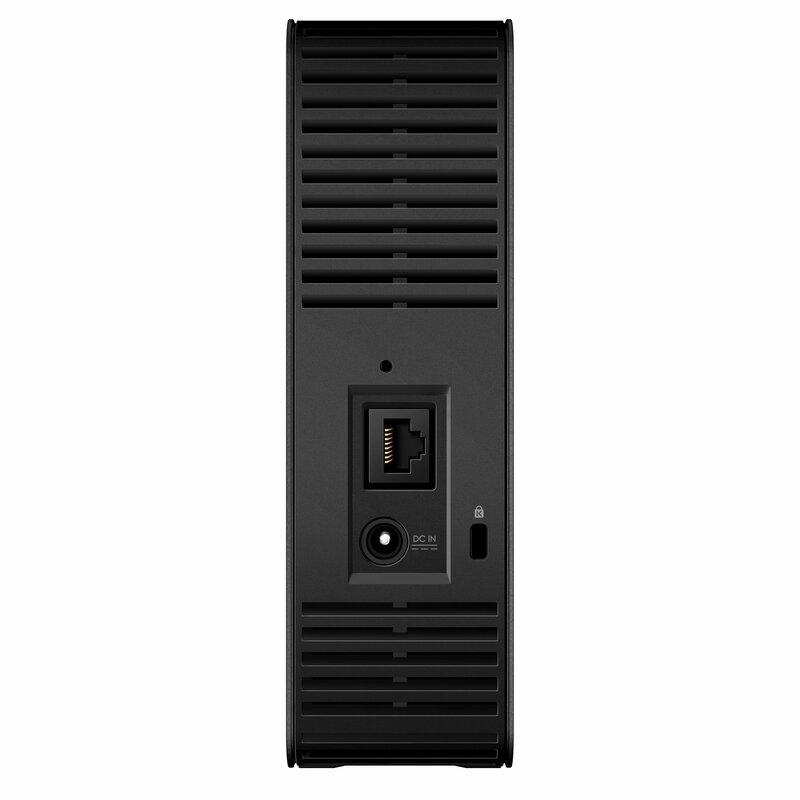 It comes in a nice shade of black and has an external power supply. The front sports the WD logo a micro tri-colour LED. The review model came with a single internal 2 terabyte drive. One terabyte and three terabyte models are also available. Note that the WDMBL can only be used as a NAS. It does not have a USB or Firewire port so cannot function as a traditional directly attached external drive. Instead it has a single Ethernet port on the back which you need to connect directly into your router over a standard cat5 or cat6 Ethernet cable (yep the blue ones with the clips on the end). 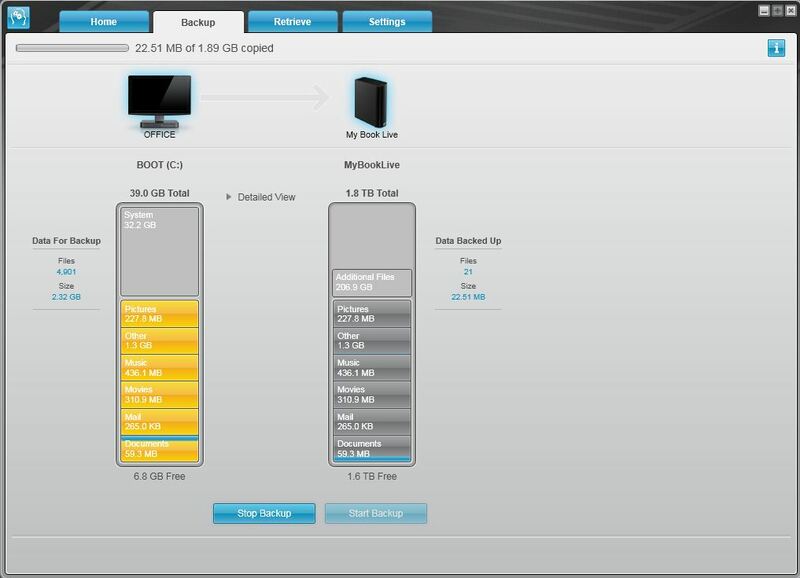 If you use a wireless LAN, you will connect to your router wirelessly and from there to the WDMBL over the wired connection. 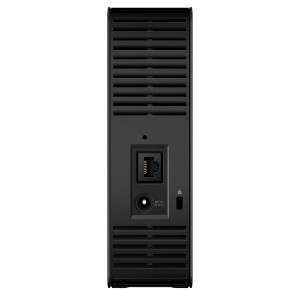 You cannot connect the NAS directly to a PC network port. Oh well technically you could but believe me, just don’t try it. Its worth noting that the Ethernet interface on the WDMBL is Gigabit capable – that’s 1 Gigabit/second (or about 100 Megabytes per second). Most wired home LANs are still 100 Megabit/second as Gigabit/second routers hubs and network cards are comparatively expensive. But if you are lucky to have a Gigabit LAN – this device will work on it and you will likely get some pretty good performance out of it. A word of caution here, just because the device has a Gigabit network interface, it does not mean it can actually move a Gigabit of data in or out of the drive. If you are a sole user reading a big sequential file (> 5GB) you might get close to the theoretical limit of 100 Megabytes/second but expect speeds of 20-70 Megabytes/second to be more the norm. If like me, you only have a 100 Megabit/second LAN, do not fear as it is backward compatible and will work fine – if a little slower. On my 100 Megabit LAN, I tested reads and writes of a 2 Gigabyte video file and in all cases capped out at the network speed (about 11 Megabytes/second) which is what you would expect as it means the drive is faster than the network. Setup is simple. Connect the other end of the supplied Ethernet cable to your router and plug in the mains. You should notice the small LED on the front light up and flash and do its thing as the device boots. After a few seconds the device will get an IP address from you router and be visible on you LAN just like any other computer. 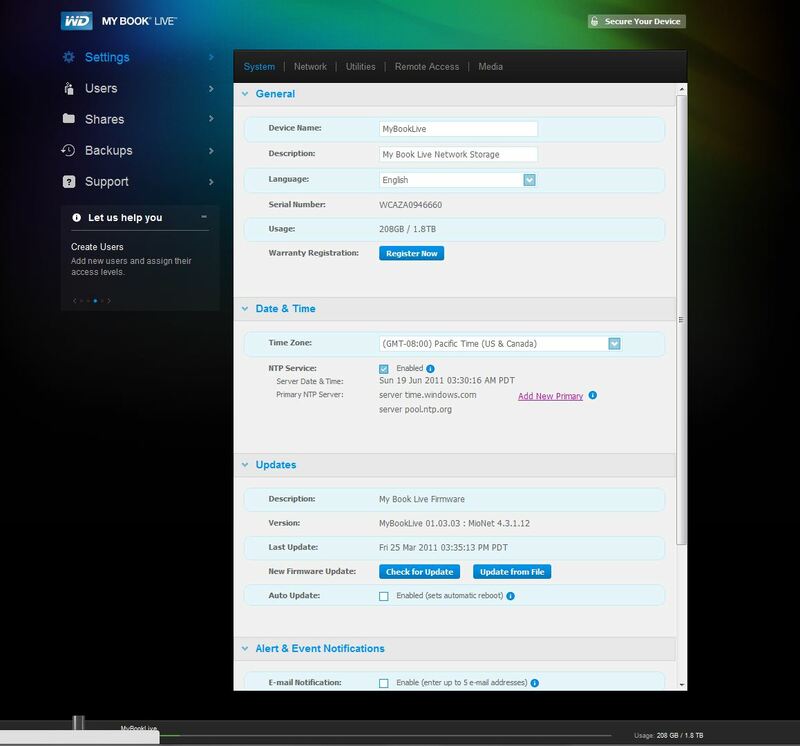 Similar to a router or network printer, the WDMBL has a built-in web interface used for configuration. The problem is determining the IP address to point your browser to. If your router assigns IP addresses automatically, you will have to determine it yourself. Its likely to be something like 192.168.0.x or 10.10.0.x. If you are really tech savvy you could ask your router by viewing the currently attached devices. If you don’t want to bother with all this, just install the WD Smartware software that comes with the device. Once installed it lives in your systray and can automatically find your WDMBL on your network and run backups for you (more on this later). But by far the most important thing it does is provide an easy link to the WDMBL’s web dashboard. Western Digital have excelled on the user interface. So often technically good devices are let down by their configuration software. Not so, this time. To say the user interface is a pleasure to use is an understatement. The menus and screens are will designed, well laid out and the animations (yes, animations) are not distracting. 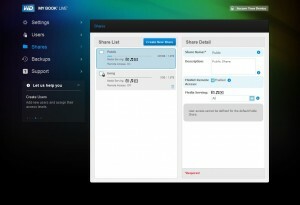 With just a few clicks, you can easily setup a share, a few users and configure the access for each share and user. All models of the WDMBL come with only one drive. This makes it simple to configure but does mean you do not have the option to use advanced features found in other models such as disk mirroring – the ability to keep two copies of you files on physically separate disks – just in case one disk fails. This means should the one drive in the WDMBL fail, you lose all your data. Given the whole point of having the device is to centrally store and secure your most precious media, this is a big risk. All I can say is make sure you have good backups. But what can you use to backup 2 Terabytes of data? Other than another 2TB WDMBL that’s not an easy problem to solve. The supplied WD Smartware software also includes a function to perform backups from your computer to the WDMBL. Where the web user interface is beautiful and simple, this piece of software is just plain weird. First off, I had lots of problems just getting it to install properly and then when I did get it to work, it just did weird things without asking. Firstly it decided to “categorise my data” on my boot C: drive. While doing this it became completely unresponsive and so you are forced to wait. Too bad that I just use my boot drive as a boot drive and do not store data there, I had to wait 10 minutes while it scanned my 40 GB boot partition and categorised what was there into pictures, music, video, email, documents and other. Anyway, once its done all that, you can specify which of these class of files you would like backed up – its an all or none affair all documents or none, all pictures or none. You cannot specify folders or files. You cannot even see them – it won’t let you! Just click the types of files you want to back up and click backup. Of course backups are that simple – not! The nice graphics will go from yellow to blue indicating the process of the backup. Once everything is blue, your backup is complete. Easy – well sort of. As you can see in the screen shot above, mine is apparently still going – apparently waiting for 3 files. Not sure why – just is. Not sure what files – it won’t tell me. Not sure what I need to do. Hmmm.I think what is going on is WD SmartWare (I could think of a better name) is actually monitoring my files and automatically mirroring any changes to them to the WDMBL. That would be cool if I could confirm it but the documentation is light on facts and provides more info on setting up Windows own backup than using itself! In summary, do what the documentation implies and use something else for your backups. The WDMBL supports media streaming to UPnP AV compatible clients via the built-in OEM version of Twonky media server. Unfortunately though it’s and old version 5.1 release of Twonky that is now quite outdated. 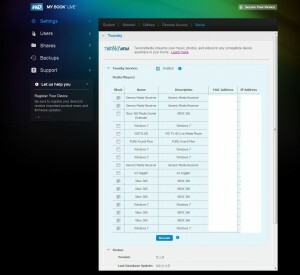 But it does allow you to stream common media formats to supported devices over the LAN. It is not possible to upgrade Twonky directly as it is built-in to the firmware and can only be changed though a firmware upgrade. Alas, to date WD have chosen not to include a newer version of Twonky in recent firware upgrades. 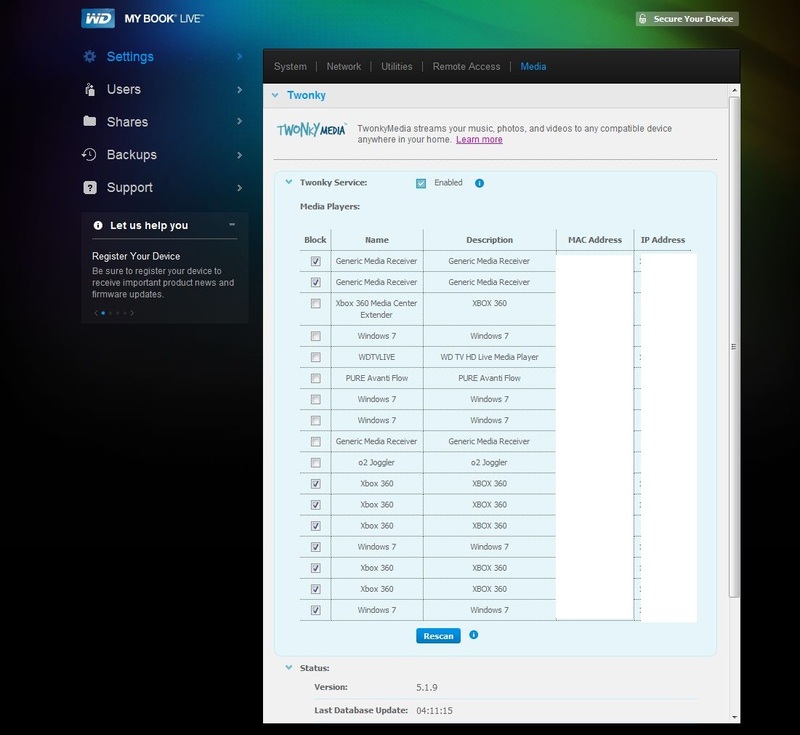 You can access the Twonky server directly via it’s own web interface on port 9000. Its cludgy to say the least (did I say it was old?). Unlike a server or desktop PC, the WDMBL is absolutely quiet. Heat is managed via convective air flow – just vents at the top and bottom of the chassis so no need for a fan. The only noise is when the drive is busy and the heads are moving but even then its hardly noticeable. This is important if you intend to keep the WDMBL in your home theatre or living room. The last thing you want is a big fan turning on in a quiet movie scene. Upgrading the firmware on the device is painless and is done through the web user interface. A one click process, checks for new firmware and if so, downloads it, installs it and then reboots the device. Neat. I now have an old iMac G5 on my LAN so I can confirm that the WDMBL plays well with it and the iMac can access shares and even use it as a time machine backup device – perfect. 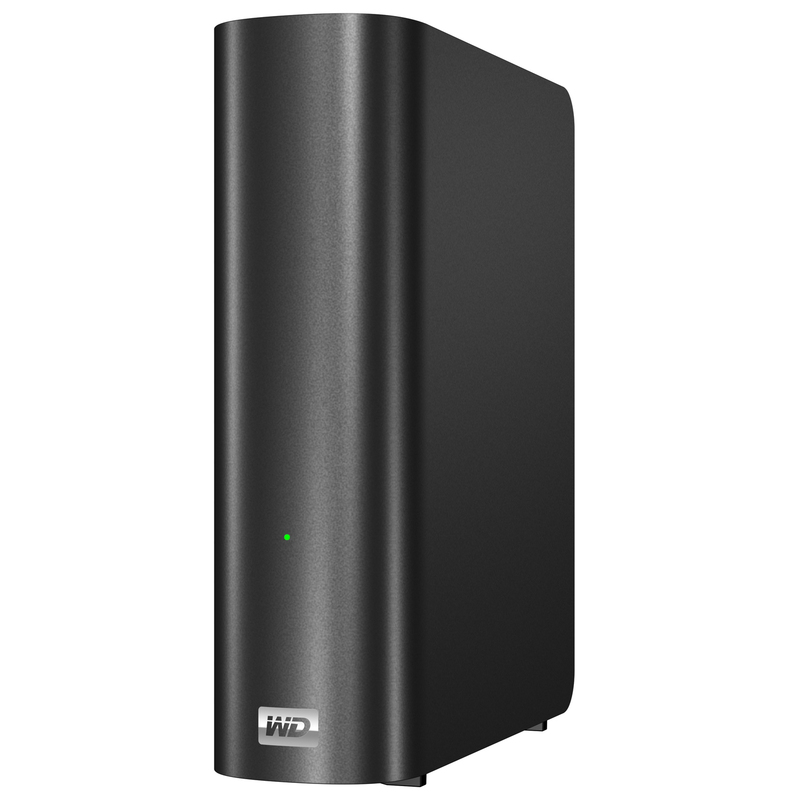 There are other consumer NAS devices out there but few are as cheap and easy to use as the Western Digital My Book Live. For only $193 (1TB), $233 (2TB) or $298 (3TB) street price you get a decent home NAS. Just don’t rely on the not so SmartWare for your backups and make sure you keep at least one other copy of your media. 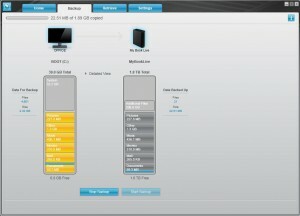 Review model supplied on loan by Western Digital Australia.